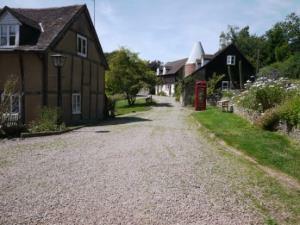 Whitewells Farm Cottages01886 880607work018886 880360fax Self-cateringWhitewells Farm cottages are seven beautifully individual cottages set around a duck pond enjoying glorious views across the picturesque countryside of Worcestershire and Herefordshire from the cottages and three garden areas. The seven Whitewells Farm Cottages vary in size and character but they all feature exposed beams and many have the original half-cruck trusses and vaulted ceilings. They are all rated as 4 star self catering accommodation by Visit England. Each cottage is fully equipped to a very high standard, has 24 hour biomass central heating (so you will never be cold), WiFi and dedicated parking spaces with additional parking available should you have visitors. Laundry facilities are available for guests to use. The gardens all have seating and eating areas and you can enjoy an hour or two watching the local wildlife or just take in the stunning scenery. Whether you want an energetic walk or a gentle stroll, consider the Malvern Hills and surrounding areas with walks suitable for all. If you would like something more challenging then the Brecon Beacons are within easy reach and when you’ve exhausted yourself recharge your batteries with a visit to Hay on Wye (book capital of the world) for coffee and cake or lunch. There are good cycle routes locally and around the Malvern Hills and surrounding areas. Local towns with a wealth of history are Malvern, Ledbury, Bromyard, Leominster and Ross on Wye. If culture appeals to you then Worcestershire and Herefordshire has it all to offer. Cathedrals, the Mappa Mundi, Cider Museum Tours, National Trust Properties and theatres. This is an area with a wonderful plethora of eating establishments from cafes and local pubs to AA rosette and Michelin starred restaurants. Within 45 minutes drive you can reach places such as Ludlow for foodies, Cheltenham for architecture addicts and racing pundits, the Black and White Trail (route taking in the most glorious black and white villages in Herefordshire), Birmingham for shopping and not forgetting the beautiful Cotswold villages such as Broadway, Chipping Campden and Burford. 14 miles from the M5 Junction 7. Follow signs towards Hereford on A4103. After Storridge, continue past Red Lion Inn and signs for Ledbury. 1/4 mile after Bromyard sign, see Whitewells sign on the roadside and turn into the drive. Fifteen miles east of Hereford on A4103.